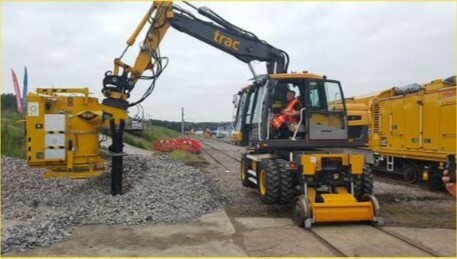 The TC2 can be deployed for a wider variety of drainage and p-way duties such as catchpit clearance, excavation of wet-beds, or excavation around track and lineside infrastructure where buried cables are a major risk to generic excavation methods, without the need for additional labour. The TC2 has a 0.75m³ capacity for material, which can be deposited into a ballast box without need to disconnect the trailer, allowing it to continue excavating within a few moments of reaching full capacity. The TC2 is compatible with Tilt Rotators alloying it to be operated within confined spaces without the free swing of its predecessor. Multiple Vacuum Hose Sizes Empty—1.3T Approx.